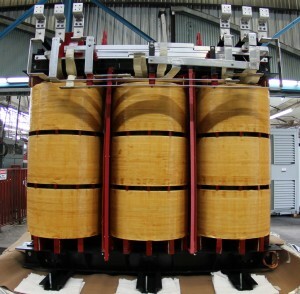 MGM Transformer Company has earned the respect of the major drives manufacturers as a supplier of reliable, high quality drives isolation transformers. All transformers are custom designed to meet the customer’s exact specifications, using the latest ANSI/IEEE criteria for harmonic loads. Derated standard distribution transformer designs are never used. As a design-and-build transformer company, we pride ourselves on our large and experienced engineering staff. Their extensive experience in the drives industry has resulted in our success as a supplier of these special transformers. Applications ranging from pumps and fans, to heavy duty-cycle steel rolling mills, have been designed and manufactured. We manufacture both liquid filled and dry type, from 15kVA to 7.5MVA. Our customers benefit because we are able to provide the best solution for any specific application. Need it fast? We can deliver. Emergencies happen and we can expedite the manufacturing of your units to meet your delivery requirements. Ask about our Bull Rush program when you place your order and we can manufacture and ship your unit in as fast as 5 working days! MGM Transformer Company can manufacture your units at our 120,000 square foot plant in the U.S. and source the raw materials solely from American companies if required. By doing so we can certify your units to be compliant with any of the various “Buy U.S.” statutes listed below (either state or federal). Please make sure to specify your requirements at the time of order. Copyright © 2005 - 2019 MGM Transformer Company. All Rights Reserved. Website by Caspian Services, Inc.